Specify the number of frames. This setting has two values. one for preview-mode and another one for render-mode. the preview value will be used for showing the preview to right side pane of the app window. the render value will be also used for the right-side pane preview when you select 'Render' on the right-pane button, and always used when you 'Exprot image'. the rendering result will be repainted if you change any parameter. it may need huge CPU power. In the rough design stage, setting a small number to 'Frames(Preview)' in preference page is recommended. Specify the size of the bitmap for one frame. Many people use the value 32x32 or 64x64. But some people seems use 4x4 times of actual knobsize (ex. 128x128), to resize by Photoshop. Also you can select the 'OverSampling' option of 'x2' or 'x4'. That will use more hi-resolution for the design stage but final export is decimated to the 'Output Image Size'. For example, 32x32 pix knob with 'x2' oversampling will be designed in 64x64 pix, 32x32pix knob with 'x4' option will be designed in 128x128 pix. The decimation algorithm is fixed to the 'Pixel Average' method. *OverSampling may get a better result in some case, but note that costs in CPU performance. Specify the direction of the stitched frames. 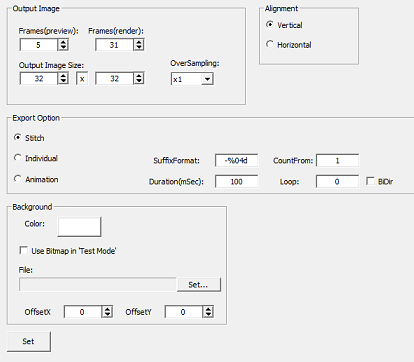 This parameter affect to the exported image if 'Stitched Strip' is specified by following 'Export Option'. Otherwise this parameter is used for only the preview display direction. These options are used when execute the 'ExportImage'. 'Stitched Strip': the default. this option make the horizontal/vertical stitched one image. 'Animation (GIF/PNG(APNG) only)': export as a animation file. In this option, export filename extension should be specified as .gif or .png. If .gif is specified, the output file will be a AnimationGIF file. If .png is specified, the output file will be a APNG (AnimatedPNG) file that will be animated on FireFox or Opera browser. In default, the animation is single direction(from=>to). By checking 'BiDir' option, the animation will be shuttle(from=>to=>from). specify the background color. the background color will be used for preview and exporting result image except for "png" and "tga" format. In the case of "png"/"tga", exproting will be done with the transparent information (alpha value) and no background. A bitmap file specified by the below field is used for the background of the preview instead of the Background Color. The background bitmap offset. you can entry these fields by simply Shift+dragging the preview pane in test-mode.